HARO is an acronym short for Help A Reporter Out; the mailing list that started on Facebook and picked up steam until it was ultimately acquired by Vocus, Inc. (which has since merged with Cision) in 2010. The HARO email alert which is delivered to your email inbox up to three times a day holds the promise of potential publicity opportunities for either your own brand or your stable of public relations clients. Scroll down the list of journalist queries until something catches your eye and you think, "Ah, this is perfect for me!" You eagerly compose an email to make your case to the journalist who posted that query, expressing why either you or your client would make an ideal source for their story in progress. Shoot it off to the anonymous email address listed, and fingers crossed, hope for the best. Here's the benefit: Journalists who post queries to HARO are actively looking for sources to round out their current stories and that makes for a great qualified lead. In addition, you can position your pitch's message directly to that query. But hurry up, because there is typically a tight deadline involved. Here's the rub: Of the 100,000 members that HARO claims as subscribers, we are guessing that the majority are those seeking publicity rather than those who are posting journalist queries, and understandably so. Of course there has to be more content than queries for HARO to work. That being said, if you are not one of the first few respondents to a particular journalist query, journalists will likely grow fatigued as they plow their way through the overwhelming email responses they receive. It's kind of like being on the 10th page of Google for a search term. Who is going past the first 2 pages? We praise HARO for establishing a precedent that journalists do in fact need your stories and your expert sources to succeed in their quest success. Kudos! But long form emails are too time consuming to read through. It wasn't always that way, but things have changed. With a more fast-paced news cycle, tighter deadlines and more pressure for everyone to deliver their best results yesterday, our tolerance and attention spans have shortened. We can fight it and lament it, or we can roll with it and adapt. Upitch approaches this PR/Journalism matchmaking dynamic from a different angle and for good reason. 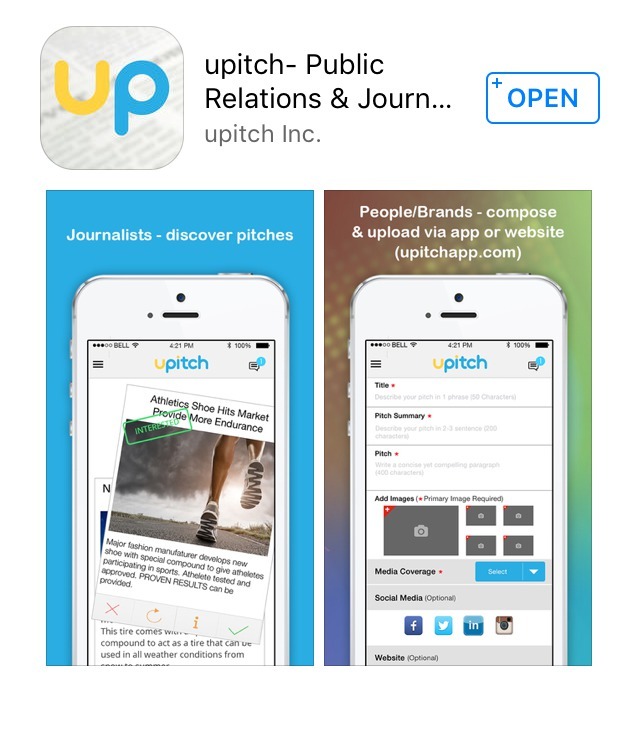 With the Upitch app, we put the power back in the hands of PR professionals and journalists. For publicists, artists, entrepreneurs and startups (aka those seeking media coverage), the app allows you to showcase your wares on your own terms with an illustrated elevator pitch complete with social media links and url. You categorize your pitch to ensure that the right eyes see it and upload it into the app's live swipe feed. Now your pitch has just as much of a shot at being seen as every other pitch uploaded in your chosen categories. No more being the 100th email to respond to a single HARO query and not getting opened. For journalists, it takes the same amount of time to read through one lengthy email as it does to swipe through 30 Upitch pitches in your swipe feed. Should I repeat that? Just let it sink in. No more opening yet another email and reading 400 words before you get to the proverbial "chase scene." On the Upitch app, you see a headline, image and summary brief on your phone's screen. Doesn't catch your eye? In less than 3-5 seconds you swipe left and move on to the next, and the next until, BAM, money shot! Hit the "i" button to expand the pitch's content and you're in business. You can then read the pitcher's 400 character pitch (only another 10 seconds of your time invested) to decide if it is worth pursuing before moving on again. If it hits your sweet spot, just shoot a text in real time to the pitcher to get the ball rolling.